When Caroline asked me to look after the JALF Bookplate Program earlier this year, I shrieked with delight. The Bookplate Program goes back to the Foundation’s birth and was initially launched as a way to say Thank You to JALF donors for their support. Everyone who contributes towards one of our charitable causes receives a unique bookplate personalised with a number and their name in Jane Austen’s handwriting. Why bookplates? Caroline, our Founder, and the Austen Knight family have a strong personal connection with bookplates. 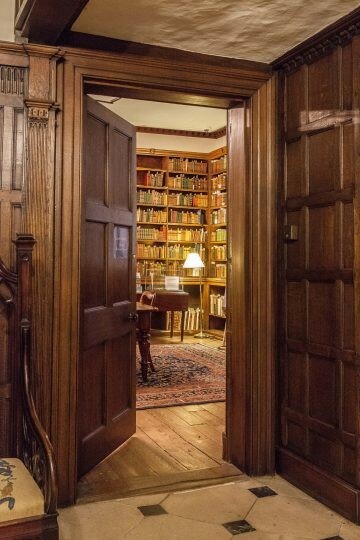 Caroline remembers how as a child she spent hours and hours in the library of Chawton House looking through the old volumes of the Knights’ collection (the same collection that her fifth great aunt Jane Austen also enjoyed), doting on elaborate bookplates that adorned the books. There were so many books decorated with bookplates in the Knights’ possession as the family not only took pride in developing their own bookplates, but also collected the tomes with the bookplates of others. It is only natural that JALF should continue and revive this enchanting tradition that Jane Austen would have been so familiar with. The library at Chawton House. Credit: Chawton House. My own familiarity with bookplates (also known as ex-librīs, a Latin phrase meaning ‘from the library of…’) started in my teens, when I first learned about them from a book I read. I was so fascinated with the idea that I tried to create both my own bookplate, as well as bookplates for the people I admired (I did not send any to them though), and two of my friends created artistic rubber stamps with my initials on them to mark my library. One day, I’ll tell you more of this story. I was very honoured to have been asked to create the commemorative bookplate for JALF last year, marking the 200th anniversary of Jane’s death. You might remember it – the one with Winchester Cathedral on it. Our Bookplate Program is on its fourth bookplate at the moment – a beautiful depiction of Mr Darcy and Elizabeth Bennet by JALF Ambassador Jane Odiwe – and we have exciting plans for the future. When you buy your bookplate from JALF (by making a donation of any amount HERE), you specify what name you would like on the bookplate – they are distributed digitally and make great gifts for long distance as well as close family and friends. We are also re-designing the letter and format that the bookplate is delivered in so that you get more information about the artist who created it for JALF. We are planning to extend special draws that will bring you absolutely unique prizes and run various other competitions. If you don’t have many books you would like to decorate with bookplates, why not start your own bookplate collection? I am very happy with mine and look forward to it growing. Image credits: Julia B. Grantham. Thank you! You have successfully subscribed to the Jane Austen Literacy Foundation. © Jane Austen Literacy Foundation 2016. All Rights Reserved.